We would not like to start this section without introducing ourselves as the business group Meifus Corp has become. Even though you can find out more information in our web page, we offer here a brief presentation as a group. 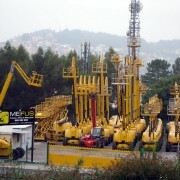 Having started as a small individual company, Meifus as we currently know it results of the grouping of a reduced number of enterprises that were only dedicated to heavy machinery buying and selling and to real estate promotion. Few years after, from Isaac Álvarez’s direction, the existing companies have been gradually developing until the definitive takeoff happens, what brought an exponential growth of the group. The opening to international markets have resulted a key point in the process, with its first subsidiaries in Panama and Angola, that allowed the financial sanitation of the holding. This way has been setting up the Meifus we know today, composed of an important number of companies that collaborate, many of them, synergically for an optimum exploitation of each business; result both of new companies foundations and successive processes of mergers and acquisitions.